When you first discover that you have bed bugs, your first reaction (besides “why is this happening to me”) is probably to find something to kill the invaders with. For many people, the weapon of choice would be a modern, effective bed bug spray. While some resort to cheap hardware-store sprays, savvy consumers are starting to keep an eye on what hired professionals use. For the past few years, that go-to professional spray has been Bedlam Plus. Throughout most of the 20th century, the Western world combatted bed bugs with DDT and organophosphates. These were simple neurotoxins that disrupted the normal nerve signals in bed bugs and other target pests. Unfortunately, they also turned out to be extremely dangerous for both humans and the local environment. To make matters worse, bed bugs began evolving to resist conventional insecticides. By the time DDT was banned from use in the United States, the surviving bed bugs were completely resistant to it. The environmental impact of DDT and the growing resistance to it forced researchers to investigate other options. In the 1970s, researchers deconstructed the pyrethrins produced by the chrysanthemum flower. This resulted in synthetic variants called pyrethroids. Pyrethroids kill bed bugs and other insects by keeping open sodium channels in their nerves, resulting in death by paralysis. Unfortunately, bed bugs began developing resistances to that method of attack as well. Today, those resistant strains make up the vast majority of the bed bug population. Now that bed bugs are commonly resistant to both traditional organophosphates and contemporary pyrethroids, insecticide developers are coming up with new ways to treat infestations. The latest generation of bed bug spray formulas now feature dual-action compounds. These combine fast-acting pyrethroids with a longer-lasting residual control method. To ensure that the pyrethroids are effective against resistant bed bugs, some products include a synergist that prevents those methods of resistance. That’s where Bedlam came in. The first bed bug spray specifically labeled for bed bugs was also the first to use a synergist to combat pyrethroid resistance. By combining the pyrethroid phenothrin with a proprietary synergist, Bedlam ensures that bed bugs can’t metabolize the chemical before it takes effect. Bedlam Plus builds on the success of this formula by adding a long-lasting neonicotinoid. Imidacloprid can stay effective for up to two weeks, long after the sprayed material dries. The resulting combination is a fast knockdown and brutally effective residual control. In testing, Bedlam Plus killed over 10 times as many bed bugs within four hours as the leading spray at the time of its invention. After 72 hours of exposure, over 90% of the test bed bug population were dead. That’s a critical improvement over the 70-80% mortality rate that other residuals produced in that time. Bedlam Plus ships in a convenient, easy-to-use aerosol can. It won’t stain water-safe fabrics and surfaces, but you should still test by spraying in an inconspicuous area and checking for possible staining or discoloration. Once that’s done, you can start your treatment of the infested area. 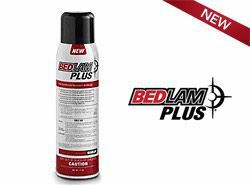 Bedlam Plus is labeled for use on critical areas where bed bugs hide indoors: mattresses, box springs, headboards, walls, floors, and baseboards. It’s safe for use on wood, carpet, upholstery, and other water-safe fabrics. Just shake the can well before each use and make sure the area is vacated of other people and animals. To use Bedlam Plus effectively, remove the sheets and pillows from your bed and spray along the seams and edges of the mattress, box spring, and bed frame, including the headboard. 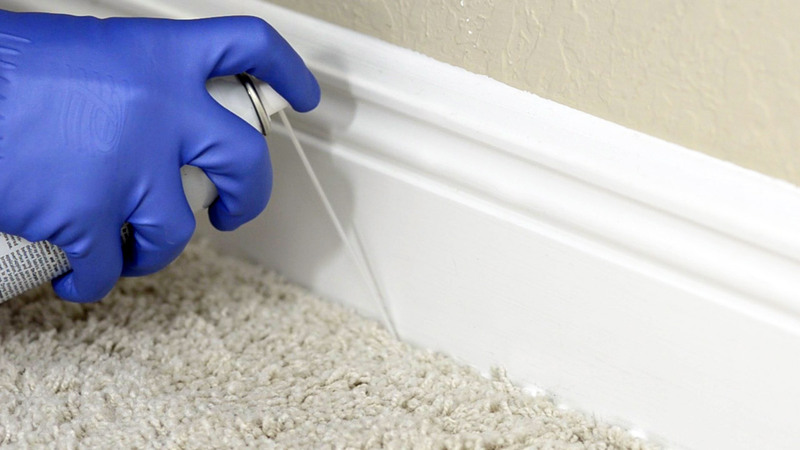 Then spray along the cracks and crevices along the walls, floors, and baseboards. The included straw applicator will help with getting deep into those spaces. There’s good reason why Bedlam Plus has become one of the go-to tools in pest management pros’ toolbox: it’s a fast and effective bed bug killer with a reliable 14-day residual that works on surfaces throughout the home. However, it can’t do the job on its own. What makes a bed bug treatment effective is not just which bed bug sprays you use, but also which other treatment methods you combine with those sprays. Bed bug treatments are complicated because bed bugs are so hard to wipe out. Every product we recommend, including Bedlam Plus, needs to be part of a complete and holistic treatment system. If you’re following our proven 4-step solution, Bedlam Plus is a critical component. Bedlam Plus features a dual mode of action that kills the toughest pyrethroid-resistant bed bugs fast. Featuring the perfect combination of quick kill and residual control, Bedlam Plus is proven to keep killing pyrethroid-resistant bed bugs and their eggs for two weeks after treatment.